The Char-Broil Vertical Electric Smoker has an insulated double wall construction that holds in the heat and the smoke so that whatever you’re smoking will be infused with smoky goodness. The 1500-watt heating element offers variable temperature control. With 505 square inches of smoking surface on three adjustable cast-iron, chrome-plated cooking grates, you control the heat, you control the smoke, and you control the outcome. Smoking salmon, turkey, or beef for jerky has never been easier or more fun. There’s no need to soak the wood chips with this low-temperature smoker, just get the Mesquite chips for ribs, roasts, or briskets, but use cherry or apple chips for a milder smoky flavor for fish, poultry, and pork. Or, how about some hickory smoked cheddar? After a little experimentation and suggestions from friends, you can change up recipes to get that just right goodness of char-broiled flavor. The three-adjustable cast-iron with chrome coating cooking grates makes it easy to vary the height between shelves to smoke different thicknesses. You have a total of 505 square inches of cooking surface that you can vary to meet your smoking needs. Using just one shelve you can smoke a big roast or brisket while using all three gives you the ability to smoke multiple slabs of ribs, bacon, or jerky. In addition, the chrome coating makes for easy cleanup and storage, so you’re ready for your next smoking project. You will love the sturdy build of this light-weight smoker, just 50 pounds, so it’s easier to move to a different location when necessary. The double wall construction ensures that the smoky goodness stays inside the smoker and not spread throughout your backyard or neighborhood. What’s more, it’s an electric smoker, so apartment and condo dwellers will be able to set this smoker up on the patio or balcony without fuss from the landlord or neighbors. And, you won’t have to worry because it has a small footprint and can easily fit in a corner of the patio. 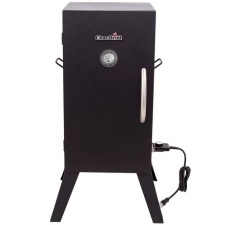 The Char-Broil Vertical Electric Smoker is a 505-square inch, 1500-watt smoker with three adjustable cast-iron, chrome-coated grates that allow you to adjust the tray heights and temperature controls so that you are always in control of the final product. You’ll be amazed at how much meat you can cook simultaneously in the little electric smoker and then cleanup takes just a few minutes. Although this char-broil smoker has 505 square inches of cooking surface it is small enough and lightweight, even with the double wall insulation for the apartment or condo balcony or patio. Therefore, it will be close at hand and convenient when you want to smoke a holiday ham shoulder or turkey. But, there’s no reason to wait for a special occasion to show off your char-broil skills with this little electric smoker. You can smoke a bunch of brats or a rack of ribs for the Sunday football game or smoke a roast all day for the Monday Night game. You’re in control, so be imaginative and thin-slice some jerky, as well. You could even smoke some cheddar for a wine and cheese tray. We considered 296 verified Amazon customer reviews with an average rating of 4.1 stars out 5 stars. 76 percent rated this electric smoker either 4 or 5 stars. A few complaints about this electric smoker were centered around the fact that the door doesn’t always close tight, so you’ll find yourself double-checking it often, but the double walled insulation hold in the smoky flavor once everything is latched tight. In summary, this electric smoker is easy to set up and operate and if smoking is your passion, you will soon find this little electric appliance is the centerpiece of your backyard or patio BBQ set up.